It was 1976 when this 30 year old, a teacher and coach at his HS Alma mater, part-time bartender and die hard Eagles fan decided to act on a whim and a dare and entered the unprecedented public tryouts for his beloved Eagles. Inspired by this quote from his high school coach mentor, “Happy are those who dream dreams and are willing to pay the price to make those dreams come true”, he figured he had nothing to lose. Papale, a ten year season ticket holder and former track star who did not play a down of college football, not only paid the price and made the cut . . . he made history! It was a time when Philadelphia fans were buried in 11 years of defeat, when Americans were battling the lingering effects of Watergate, the Vietnam War and a sweeping energy crisis. Ordinary people appeared badly in need of a champion from their ranks and Vince answered the call. Now, in today’s uncertain economic times he continues to respond to the need for a motivating hero who knows what it’s like to battle and overcome adversity. Instantly electrifying the fans and eventually winning over skeptical teammates with his gritty play, Papale helped the Eagles rediscover their winning ways. From being voted Special Teams Captain by his teammates to earning Eagles “man of the Year’ in 1978 for his numerous charitable activities Papale was an NFL sensation until a shoulder injury ended his playing career in 1979. Having now added “cancer survivor” to his bio, Papale continues to hold the record for being the oldest rookie in the National Football League (kickers excluded). He was recently honored by the Eagles and their fans and was named “Most Outstanding Special Teams Player” during a celebration of the Philadelphia Eagles 75th anniversary. Vince is married to former US World Team Gymnast, Janet Cantwell, and they reside in Cherry Hill, NJ, with their two children Gabriella and Vincent. Today, he electrifies audiences and is regarded as one of the top motivational speakers on the country. The ultimate underdog continues to thrill audiences with his energy and humor. D ennis Franks is a native of Pittsburgh, Pennsylvania and graduate of Bethel Park High School. Dennis was recruited by more than 100 colleges to play Football or pursue Track and Field. Dennis accepted an athletic scholarship to the University of Michigan where he majored in Economics. Dennis started three years as an offensive center, and was awarded All Big Ten, and Second Team All American Honors in his senior year. Dennis played for the Philadelphia Eagles and Detroit Lions for 5 years. He captained the special teams and was named Most Valuable Player during his years in Philadelphia. Dennis finished his NFL career with the Detroit Lions where he helped build the Lions back to a playoff contender! For more than 30 years after football, Dennis has applied his high energy, team building talents and communication skills to making a difference for Salesforces, Management teams and Entrepreneurs in 10 countries around the world. Dennis has successfully impacted Business Professionals in the Distribution, Internet Marketing, Franchising, Pharmaceutical, Health Professionals, Direct Sales and Construction Industries. Some of his most powerful talks have been built around I.M.P.A.C.T. Selling, Life is a Contact Sport, and Get into the Game. Dennis’ Versatility and Never Give Up Attitude on life and business has set him apart from other featured speakers. Dennis is an exceptional communicator that will bring out the best in your team. Dennis and his wife Nancy has successfully built multi million dollar entities in retail shipping, printing and business service centers, Health and weight management consulting, and Distribution and Internet marketing. Dennis is part owner of Shop.com, an online shopping site ranked in the top 100 shopping sites in the world. 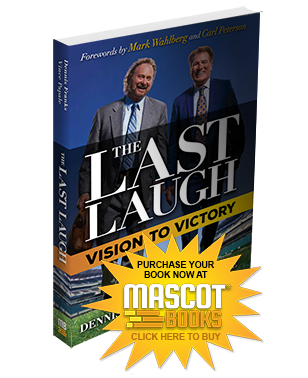 Dennis continues to break through new barriers of human performance in supporting man’s quest for taking a dream into reality with the January release of a new book, “The Last Laugh”, that is co-authored with good friend and former Philadelphia Eagle Teammate Vince Papale. Dennis Franks is married and resides in Greensboro, North Carolina with his beautiful wife, Nancy. They have two amazing daughters, Lauren and Katie, both are married living in Malibu, California and Charlotte North Carolina respectively. Dennis and Nancy have one grandchild, “Izzy”. Grab the book and take your seat at the table with Vince, Dennis, and their star-studded hall of fame. What you'll achieve will astound you.